It’s no secret that hyper-competitive online focused experiences are dominating the gaming scene at the moment. A quick glimpse at my Nintendo Switch friends list is all the proof you need, the screen displaying a sea of players on games like Fortnite, Rocket League and Paladins. While there’s no denying the edge of your seat fun to be had from diving into these sorts of titles, Pode acts as a reminder that not every multiplayer experience needs to follow suit and sometimes it’s nice to just sit back and unwind in a world moving at a much more relaxed pace. Pode tells the tale of a fallen star named Glo and a rock named Bulder who happen to cross paths following Glo’s accidental crash landing. The pair then team up and embark on a mystic and sometimes even emotional journey in an effort to help Glo return home. The story may be simple but it’s enough to get you moving and all so lovingly told through short and sweet cutscenes. While both the leads might lack a true voice, it’s their endearing animation and cute noises that sell their relationship surprisingly well and help connect you as a part of their team. In fact, it’s this theme of teamwork and friendship that flows throughout Pode; whether it’s through the story or even how the actual game plays. Whether playing this game alone or with another controlling the other character, you’ll need to rely very much on both Glo and Bulder in order to succeed and progress. Sure both characters at their core may feel and handle the same, but it’s the unique abilities they each possess that encourage cooperation between the two, something even more important if you happen to be playing with a second human player. Glo is the lighter of the two (no pun intended) making swimming across pools of water possible. More importantly though is Glo’s ability to grow any wildlife nearby at the press of a button. Not just a beautiful visual effect, this power can form platforms from leaves and flowers for the pair to use. Bulder, on the other hand, is understandably heavier making water a no-go. Thanks to the added weight though, Bulder can push switches on the floor and even swallow other rocks too. Just like Glo though, Bulder can also manipulate the environment only instead of wildlife its rocks and crystals. The game introduces new powers at a nice pace making sure never to overwhelm the player with too much too fast. This helps keep things interesting too. Just when you feel like a certain mechanic has reached its creative limit, you’ll stumble across a new idea not only in terms of puzzle design but what Glo and Bulder can actually do. Individually these abilities are easy enough to understand and make use of, however as your adventure progresses, you’ll be called upon to combine them and work together with your partner. Puzzles continue to grow in complexity (although never to the point of trial and error or frustration) often pushing you to search for solutions not just around each room you enter but also with the tools at your disposal. One such example involves one of Glo’s abilities you unlock a little later in the game – teleportation, a unique trait that when used in the correct way can transport both characters at the same time. Pode works well enough as a single player experience allowing you to Switch between Glo and Bulder at any point, however as one might expect this isn’t the ideal way to play. Pode is best experienced with someone else, the pair of you constantly needing to communicate and work as a unit – something you don’t truly get a sense of when having to control both characters yourself. Playing with my wife would often result in each room starting out with us simply wondering around searching for plant life to grow or hidden switches to step on. Exploring done, we would then work together on forming a solution to unlock the door and move onto the next puzzle. It’s greatly rewarding when you do take down a particularly clever puzzle, especially ones where both Glo and Bulder get their chance to shine. 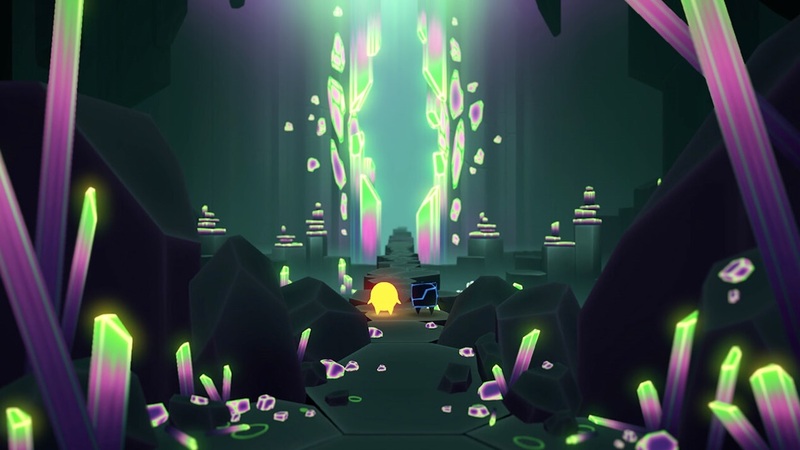 The visuals in Pode are bright and colourful, truly coming to life as you slowly use your powers to bloom flowers or raise rocks and crystals. While the game’s cave-like setting could have easily outstayed its welcome, physically adding colour and depth to each area yourself keeps things feeling fresh. Pode is a clever co-operative puzzle-platformer whose spotlight on both camaraderie and companionship makes for one of the more genuinely moving experiences I’ve had on Switch. Coupled with the game’s bright and charming visuals, Pode is such a delightfully unexpected surprise and a must for anyone looking for an engaging team-based game on the Nintendo eShop.